Photinias embrace a large family of small evergreen trees or shrubs. 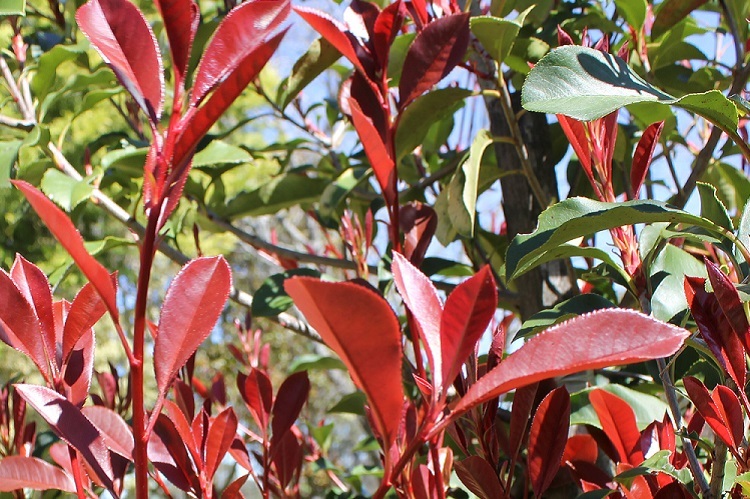 There are some 60 species that naturally occur throughout Asia but Photinias have become extremely popular in Australian gardens thanks to their spectacular bright red new growth foliage and their highly effective hedging qualities. The name Photinias owes its origin to the Greek ‘photeinos’ or ‘shiny’ in English —an apt description of its typically glossy leaves. Its size as a small tree, rapid and dense growth, and colourful foliage make it a perfect choice for creating a hedge or screen for privacy in your backyard. This is why so many Australian gardeners have come to love Photinias. 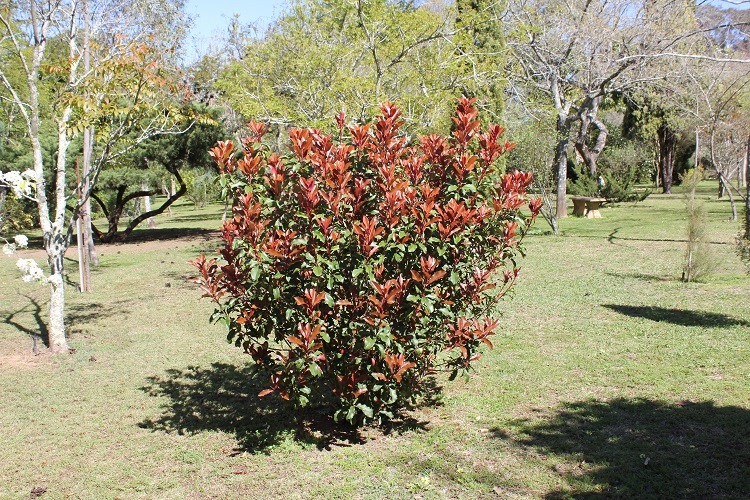 Photinia have a reputation for easy care solid hardiness and will tolerate a wide range of growing conditions and even gardener neglect. Photinia is part of the rose family and it produces large numbers of small white flowers in mid to late spring. Photinias also produce small apple-shaped red fruits, which the birds love. But you need to be aware, especially if you have young children, that the leaves and fruits of some Photinia species may contain carcinogenic compounds. Photinia make great hedges for privacy and shelter, and the various hybrid varieties all have unique features that make them ideal for a range of different garden settings. Photinia robusta, as the name suggests, is drought resistant and works well as a windbreak growing up to 6m high. If you’re looking for a smaller, more refined evergreen shrub then have a look at Photinia glabra rubens. The fast growing nature and the stunning contrast created by the brilliant red new foliage against the more mature deep green leaves makes Photinia fraseri ‘Red Robin’ a very popular variety too growing to around 2m high. The question of Photinia robusta vs RedRobin simply comes down to what you want your Photinia to do: grow to become a tall windbreak or remain as a short hedge. One problem that gardeners sometimes confront with Photinias is that their prolific growth rates require regular pruning. And if you choose the wrong variety for your setting you can very quickly find that your hedge is growing out of control. Ozbreed have taken the time to make sure you have the ‘right plant’ for the ‘right place’. We offer two very special Photinia varieties. They have been through very rigorous sourcing and trialling processes so that you can be confident that you are buying the right plant for your garden. Thin Red™ Photinia is ideal for those tight narrow spaces where you need to establish some solid shelter without taking too much space from your backyard. It grows well in full sun or part shade and in most soil types making it a good choice for a privacy hedge or screen between a carport and the neighbouring property. Thin Red™ Photinia will also make a wonderful screen for the front of your property. Beautiful new red leaves and small white flowers make a lovely showing. Red Fence™ Photinia—the name says it all—forms a perfect hedge. It will grow up to 2m high in good soil conditions but otherwise will reach a very manageable 1.5 m high x 1m wide. It forms a dense hedge without requiring a lot of pruning (once a year is usually sufficient). Plant in full sun or part shade. 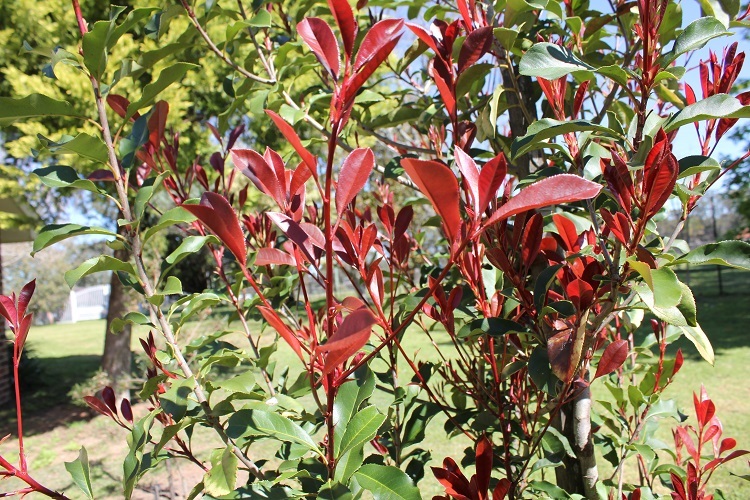 Red Fence™ Photinia grows well in South Queensland, Western Australia, Tasmania, NSW, Victoria, ACT, and South Australia. Photinia are a hardy plant and they will survive a certain degree of gardener neglect. But like most plants you’ll get much better results if you just follow a few very simple growing and care tips. Plant your Photinias between 60 and 100 cm apart for a solid hedge. Photinia does prefer full sun but part shade is fine too. If your site is more on the shady side try to ensure that there is good air movement. This is because Photinia can be prone to fungal attack if there is too much moisture around. In shadier spots it would be wise to plant your Photinias a little further apart to give your plants a little more space and make the area less conducive to fungal growth. Photinias need very little watering once established. It’s worth thinking for a moment about where you want to plant your Photinia. Photinia will tolerate a wide range of soil types but good drainage is pretty important. Soil that has good structure and is well supplied with nutrients will obviously encourage your Photinia to grow more prolifically and strongly. Avoid soil with high pH levels. And also avoid areas where water tends to pool because even the best soil won’t help your Photinia overcome excess water. Fertilise at least once a year with some slow release fertiliser, and some good chunky mulch around the base of the plants will also help to ensure good moisture and nutrient levels in the soil. Leave a space between the mulch and the plant stem to avoid encouraging rot. Mulching with pine bark is discouraged because it can lower nitrogen levels in the soil. Photinia have quite low watering requirements and their drought tolerance allows them to thrive in most parts of Australia from South Queensland and Western Australia down to Tasmania. Photinias make perfect hedges because of their rapid growth and dense foliage. This means pruning is one of the few critical routine tasks that you will want to do to get the best out of your hedge. Regular pruning will help to maintain a really tidy dense hedge. Usually a tidy-up prune once or twice a year is enough. Cutting back quite severely after the new growth starts to change to the mature foliage colour will encourage more of the spectacular red foliage. 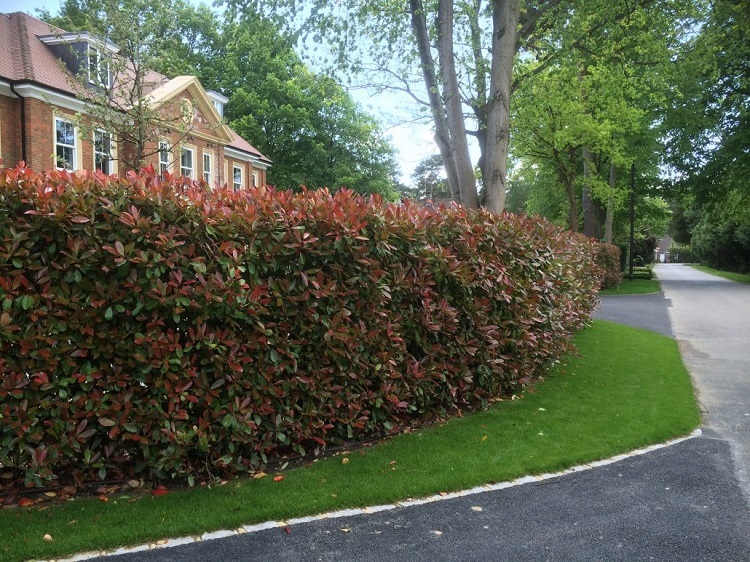 The reduced pruning requirements of Red Fence™ Photinia x fraseri makes this variety especially popular for hedges, particularly where large areas of hedging need to be maintained. Pruning Red Fence™ Photinia x fraseri once a year will generally maintain your hedge at its finest. If you want a good flower showing avoid pruning in early spring when the flower buds are starting to form. The flowers in some varieties are not renowned for having a very attractive aroma. And if you value your Photinia more for the contrasting foliage you may prefer to prune the buds before they flower. Like many hedging plants if you neglect to prune Photinia they can become scraggly. Fortunately, you can usually resurrect them with a good hard prune. In most case your plants will bounce back with healthy fresh new growth. Too much moisture is the bane of the Photinia. Photinia can be susceptible to fungal attacks. Entomosporium leaf spot is a fungus that attacks the leaves. Leaf spot shows up as red spots often surrounded by a yellow ring. The infection may cause the leaves to drop. Remove infected foliage and ensure adequate ventilation and also reduce watering. Powdery mildew is another fungal infection that often attacks Photinia. Like most fungi, the white powdery growth seen on leaves and shoots loves moist damp conditions. Try to give the plants more exposure to the sun but where the infections are especially resistant you may need to apply a sulphur-based spray. Root and crown rots are also the result of too much water and may lead to wilted leaves and premature leaf fall, bark discolouration, and dead stems. Stop watering and allow the roots to dry out. If you feel the situation merits more serious remedial measures then you can temporarily remove soil from around the stem down to the top roots to encourage the drying out process. Fungicides can help as a preventative measure. The bacterial infection, Fire blight (Erwinia amylovora), can devastate Photinia. The disease results in wilting leaves and ugly brown cankers on the stems. Once again, damp cold conditions allow this disease to flourish. Remove diseased tissue and avoid too much nitrogen-rich fertiliser. Copper fungicides may prove effective. 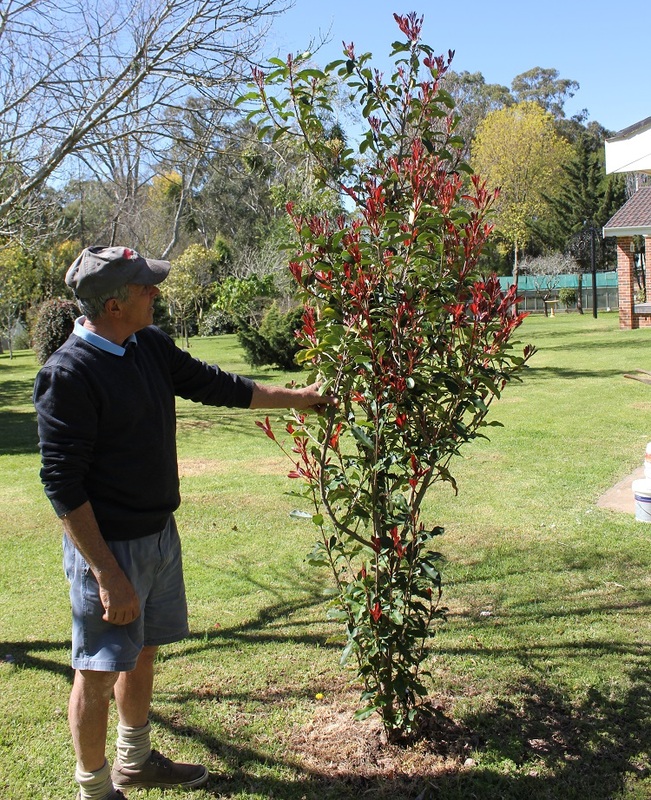 It’s hardly surprising that Photinia are one of the most popular hedging plants in Australia. Drought resistance, hardiness and rapid growth combined with the spectacular contrast of the brilliant red new foliage against the darker green mature foliage makes it a winner every time.